Unique Oregon Weddings: Surrounded by family and friends, your wedding day will be one of the most memorable of your entire life. The diverse state of Oregon provides numerous backdrops and ideas for unique and spectacular destination-style weddings and honeymoon opportunities. A ceremony at Vista House puts you and your guests 733 feet above the Columbia River and commands a breathtaking (though often very windy) view of the Gorge below. It’s only 20 miles from Portland and the drive there can be as beautiful as the venue itself. You could opt for a drier and more rustic location by heading to Central Oregon’s High Desert Museum to be surrounded by sagebrush, otters and birds of prey. If a museum fails to interest you, head south and get hitched at a genuine working cattle and guest ranch, Green Springs Box R Ranch in Ashland. If the ocean calls to you, Ecola State Park near Cannon Beach offers a spectacular view of the Pacific and the surrounding coastal mountain range. Get even closer to the waves with a sunset ceremony planted in the sand with Haystack Rock as your witness. The Willamette Valley offers yet more unique options for your perfect day and an alternative to traditional Portland wedding venues. 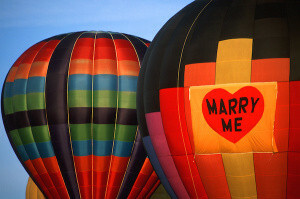 While a winery makes a beautiful location for your wedding, why not book one for an afternoon reception and start your marriage off at sunrise more than 1,000 feet in the air as you soar above the wine country in a hot air balloon. Vista Balloon Adventures can accommodate an outdoor wedding at ground level before the bride and groom lift off, a ceremony in mid-air with up to 10 passengers in one balloon (a fantastic flying small wedding venue), or charter the entire fleet of 6 hot air balloons for groups of up to 40. There is no doubt that this would be an unforgettable memory for you and your guests! It might also be useful to note that hot air balloon weddings can also be a surprisingly affordable alternative to traditional wedding venues. Want more ideas for unique wedding destinations? Check out these additional thoughts from Glamour Magazine, BravoBride, and Wedding Chicks.